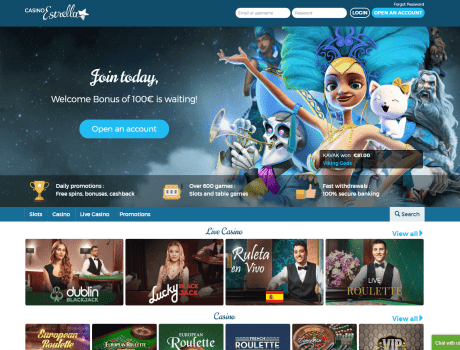 Join CasinoEstrella today for extra fun, excitement and extra rewards. Their promotions program rewards you immediately upon your first deposit with a 100% match bonus up to €100. Use your extra cash to play over 500 games, online and over any mobile device, which also include a full suite of live casino products. You must wager a total of 30 times the sum of your deposit and bonus before you can withdraw your bonus. For example, a deposit of €100 will result in a $100 bonus and you will receive a total amount of €200. You will be required to wager €200 x 30 = €6,000 in the casino before you may cash out. To see your bonus and how much you need to wager go to “Bonuses” by clicking the menu button in the top corner. The welcome bonus is not valid for customers from Albania, Armenia, Brazil, Belarus, Bulgaria, China, Croatia, Georgia, Germany, Greece, Hungary, Indonesia, Ireland, Kazakhstan, Latvia, Lithuania, Macedonia, Moldova, Montenegro, Myanmar, Norway, Romania, Russia, Serbia, Sweden, The Netherlands, The Netherland Antilles, Philippines, Poland, The United Kingdom, Turkey, Ukraine and U.S.A.